"Today, Project Islamic HOPE is calling upon the arrest and criminal prosecution of 'Empire' star and actor Jussie Smollett. We believe Mr. Smollett lied about being the victim of a hate crime and being assaulted, and for us, it's a slap in the face." "Mr. Smollett put people's lives at risk and could have created a situation that was much more damaging for those who are African American and for those who do identify with the LGBT community. We have many members of the black community and the LGBT community who have been the victims of racism and hate crimes, so for Smollett to say that he was a victim of racism and hate crime -- and we believe that is a lie -- certainly is an injustice to those true victims of racism and hate crimes." "Jussie Smollett must be brought to justice for lying," Ali said, adding: "We gave him the befit of the doubt" until Smollett's "campaign of lies" unraveled his story. Ali continued: "Also, Smollett could have created a race war! There were many African American and many members of the LGBT community who were very upset and outraged by Smollett claiming he was attacked and victimized. So there were some in those communities whose thoughts are a little more extreme, they wanted to retaliated." "If Jussie Smollett really wants to do what's right: he'll stop lying," said the activist, noting that the actor needs to offer an apology. +1 to Jussie Smollet for (yet again) revealing the MSM for what they are. Looks like he's being written out of the script anyway. Tough break. Less work for Jussie means more work for writers, who are busy making edits. In the past 24 hours, we're told the script has undergone multiple revisions. "Its not a lie......if you believe it". 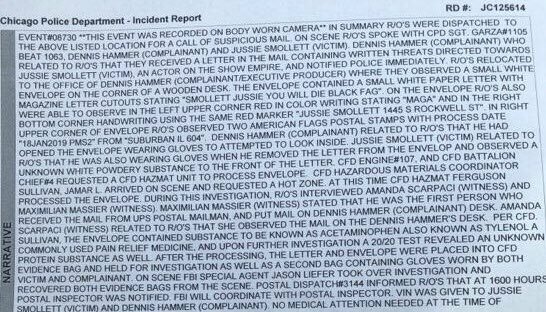 Smollett is facing criminal liability for staging a hoax attack and filing a false statement to the CPD. Typically not the largest of legal problems given the political correctness which reigns, but not in this case, which has drained many resources and captured the attention of the media and politicians. But the liability he should be most worried about is the threatening letter sent (with powder which apparently turned out to be aspirin). That is an invitation for a prison sentence with the Feds. I noticed his initial counsel - well known and very good - dropped representation after Smollett insisted on going to the press again to proclaim his innocence, giving prosecutors yet another pot of gold to undermine Smollett’s credibility. One has to wonder if Smollett has any true friends in his life. If I were a friend to him, as a practicing lawyer I would have insisted he shut up weeks ago. It is painful to see a guy self destruct over emotionally laden political motivations. He will serve as a useful tool for many, but will be alone and having to deal with the criminal justice system. Did you know there was a real attack on a gay black man that resulted in the victim being blinded in one eye? And that the number of attackers was not two but more than a dozen? And that not one of the attackers did any jail time? Attacked and beaten in Brooklyn in 2013 by over a dozen Jews. Left blind in one eye. Nobody went to jail -- system falsely claimed lack of evidence (a public bus stopped and took pics of the attack, there were video recordings and DNA evidence). Where was the national media and outrage over this attack and failure to prosecute? You are a hateful, white privileged, "anti-semite"!!!! This. He likely could have got away with probation for the hoax attack, but add the letter with powder, and we're going to see him go to the big house. This situation is an incredible metaphor for the democratic party and its supporters. 2019 and beyond is going to be a very rough time psychologically for many 'liberals' as the dominoes of their delusion fall faster and faster. RE: it's pretty crazy that some people still talk about the Jussie Smollet "attack" as if it actually happened 2/19/2019 2:30PM - in reply to Will viewers care? Mark Geragos reportedly is close to becoming Jussie Smollett's new criminal defense lawyer, and all signs were pointing to it Monday night. Geragos appeared on CNN and made a ferocious case supporting Jussie and throwing major shade on the Chicago Police Department. Geragos suggested the leaks coming from the police were a thinly veiled attempt to skewer the actor. Jussie Smollett loves s big mullets. the liberals will wake up, quit seeking racism, mysognoy, xenophobia, bigotry and hatred in every where their eyes look. Guilty as he is of filing a false police report, he'll never get jail time...just probation. “I feel like he f—ed up Black History Month, bro,” the rapper explained. The rapper suggested the possibility that maybe he has been framed — though that seems highly unlikely and no evidence of such has been made public. “But if he’s not, then bro he f—ed up for real,” the rapper said. His real issue is with the FBI. But as he's friends with the Obamas, the Deep State likely won't prosecute. Personally, yoga pants would be more believable than UGG boots (in USA). I need Barbara Billingsly to translate this for me. Make the envelope less obvious, already? Figuring out who mailed a letter has been made easier because, while most criminals know to wear gloves to avoid leaving fingerprints, most criminals also forget to leave their cellphones at home when they go to the mailbox. The FBI and the U.S. 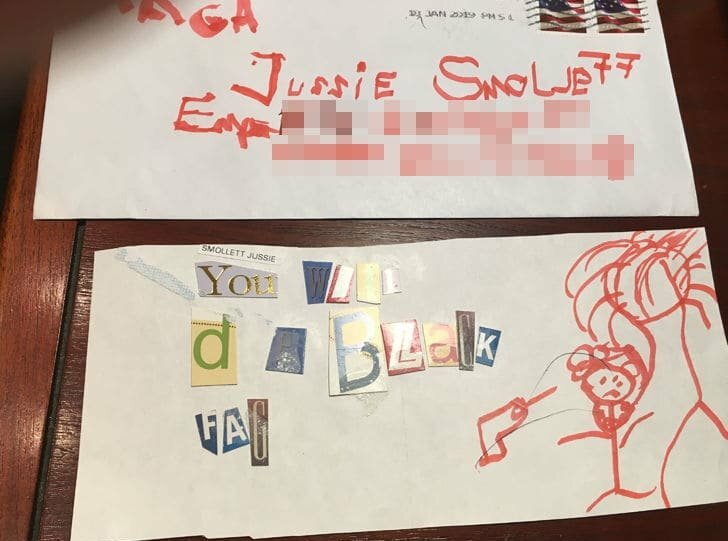 Postal Inspection Service has been quietly working on the origins of Smollett’s letter for nearly a month. Giving it far more “attention” than he knew. "This is not a whodunit. It's a how-many-people-dunit."